Kanes Pond is located behind a shutdown factory in Holbrook, this pond actually has a pretty interesting story behind it. This used to be an old rock quarry so it's pretty deep in the middle. One day while they were digging, one of the cranes hit an underground spring that ended up flooding the quarry. They were able to get all of the machinery except for one crane that is still stuck in the ground on the eastern shore. So to get to this place you can either park at the end of Spring Lane and walk over to the eastern shore or you can park behind the building on Spring St, which I'll mark for you, and navigate the paths through the trees to find the water. 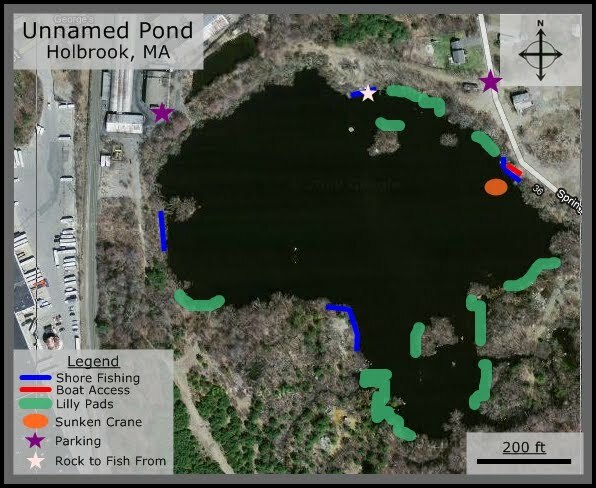 There are several spots to fish around the pond, including near the crane, a spot on a big rock on the northern shore, or along the path that wraps around the western and southern shores. If you fish from the big rock on the northern shore, there is an island that you can cast out towards where there are some lilly pads that a lot of fish congregate around. If you're over by the crane, you can fish to the right where there are some weeds and bushes to work. There is also another island off of the western shore where a friend of my caught an 8 lb bass. I know right? 8 lbs for such a small pond? That's why this place is such a great find. There are very few weeds in this pond so you can pretty much use any type of lure that you want and I'm sure you'll have some success. I had the most success fishing off of the rock on the north shore . If you have the energy to carry a boat over from Spring Lane you can get it in there and work several more spots that are sure to be potent like in the coves in the south east corner or the most southern shore that can't be reached from the land. Good luck! UPDATE: Apparently there have been "No Trespassing" signs hung up in the area. I haven't been in many years but if this is true, I would suggest avoiding this place. Plenty of spots to fish in MA, no need to do it illegally. I went to this area today, only to be very disappointed. There isn't any access to the pond. The warehouse is fenced in and "no trespassing" and "police take notice" signs are posted everywhere. The area is completely inaccessible. good luck fishing elsewhere! This Pond If Called Kanes Pond I've Fished There My Whole Life Since I Grew Up In Avon Right Up The Street . there are Some Pretty Decent Sized Fish There My Girlfriend pulled A Three And A Half Pound BaSs Out Of There A Few Years Ago. Haven't Been There In A While But The Fishing Used To Be Really Good. There Is A Side Street Down The Road From Three Factory And At The End Of The Street Is A Old House Where Nobody Life And You Can Access The Pond That Way There Are No Trespassing Signs But Nobody Including The Police Will Bother You If You Go In That Way. Good Luck!!! Thx Michael I might give Kanes a try. I live up the road but have never tried due to the keep out signs. Didnt want to chance being bitten by a big dog or shot at by some Granny Clampett look alike. Fished at Cains today and it sucked. May try putting the kayak in next time. We fished late afternoon to around 8:30. Got a few dinks but nothing worth weighing. Question: Is this the same pond where the McGuire chemical spill was? Only ask because its definitely not far and its all fenced off w/ abandoned industrial buildings. Anyone from Holbrook know? Had a lot of luck jigging largemouth once i got a lure that wasn't too bad in the weeds. Went here in 2012. Tried the end of Spring Street. No good since there were a lot of posted signs plus the last house on the right is occupied by a state police. Not a good idea to trespass. Did find the water by parking in the industrial lot just past the railroad tracks. cross the tracks and there are some small paths. Not easy but doable. Very little shore access and didn't feel like hiking all around to get to the rock and crane. If anyone has found a better way in here please post.